Article first published as Blu-ray Review: Broadcast News — The Criterion Collection on Blogcritics. One of the great films of the ’80s and indeed, one of the finest romantic comedies ever made, Broadcast News has often had the misfortune of being overlooked and underappreciated, just like its writer and director, James L. Brooks. Sure, Brooks is responsible for his share of stinkers, including recent non-starter How Do You Know, but lest one forget, Brooks is a supreme director of actors, a writer simultaneously gentle and acerbic, and a sharp-minded producer responsible for successes on the big screen and small. All of these qualities coalesce in Brooks’s greatest achievement, Broadcast News, which was nominated for seven Oscars and seemingly promptly forgotten after it failed to win any of them. You won’t find the film on any great movies lists (at least, none I’m aware of) and even in a discussion of Brooks (who has only directed six films as of this review), you’re more likely to hear about Terms of Endearment or As Good as it Gets. I would have never expected the folks at the Criterion Collection to release the film, but I’m overjoyed that they have. In my mind, it’s as significant a release for the company as its upcoming box set of rare Mikio Naruse silents. Sure, Broadcast News has been readily available in this country since its release, but Criterion’s edition adds insightful supplements, reveals the attractive photography the previous edition didn’t and provides what one hopes is the impetus for a new wave of recognition for the film. Broadcast News stars Holly Hunter as ambitious news producer Jane Craig. Along with brilliant-but-insecure reporter Aaron Altman (Albert Brooks), Jane pushes their Washington, D.C. network affiliate for hard-charging stories, but the climate is changing — personified by the handsome but incompetent Tom Grunick (William Hurt), who succeeds almost in spite of himself. His good looks and smooth delivery mark a sea change for the news industry, which is veering toward obsequious infotainment, much to the chagrin of Jane and Aaron. But unlike Sydney Lumet’s Network, Broadcast News isn’t a wholecloth media satire, although Brooks’s observations about the industry are consistently on-point. The sharpest lines are saved for the romantic triangle that ensues between Jane, Tom and Aaron, a messy mix of emotions that’s fueled as much by the thrill of a fast-paced workplace as it is romantic inclination. Albert Brooks’s Aaron wears his heart on his sleeve with regards to Jane, a close friend who he also wants to romance, even if we never really believe it could happen. Brooks is a master at communicating the futility and earnestness of his feelings, culminating in a beautiful short monologue where he wishes out loud that Jane could be two people — the woman he loves and the friend who he could confess that love to. Albert Brooks makes the James Brooks dialogue sparkle at every turn. Similarly, Hunter is in total command of a wide range of emotions as the high-strung Jane — a character that is almost always cranked up to 10, but which Hunter refuses to let become a caricature. As she falls for Tom, who represents everything she despises, she makes the relationship seem plausible, justifying it to the audience as well as she justifies it to herself. Hurt’s aggressively bland performance isn’t to be forgotten either, as he imbues Tom with an unwitting and unaware blank slate nature that makes him perfect for the television industry. It takes an intelligent actor to play a character this dumb. Broadcast News features a pitch-perfect script that just oozes cleverness, but somehow maintains the perfect balance of pathos and humor needed to come off as genuine. It never feels dependent on screenplay-ese. But more than simply exhibiting Brooks’s talents as a writer, the film shows that he knows how to direct a picture as well. Consider a scene that features a beat-the-clock running of a tape from the edit bay to the control room that functions like a breathless car chase. Or the scene where Jane feeds Tom all the right words during a live newscast — Brooks shoots both characters from behind in extreme close-up in the foreground, with the related action taking place on the edge of the frame. These are striking images for a dialogue-heavy romantic comedy. I’ll go ahead and say it: Broadcast News is an unqualified masterpiece. In an age where almost every Hollywood romantic comedy seems to evoke groans of genre fatigue, it’s heartening to watch a film that can fit within the mold while existing as a vibrant character piece with touches of ironic subtext around the corners. Add three truly great performances to the mix, and you’ve got a film that is long overdue for some fervent praise. Broadcast News is presented in 1080p high definition with an aspect ratio of 1.85:1. This presentation easily blows the previous Fox DVD out of the water. That edition featured a non-anamorphic, cropped image that was riddled with digital artifacts. It would be easy to think that the film was visually undistinguished, ugly even, from watching it, but this Blu-ray release sets the record straight. Michael Ballhaus’s unassuming photography shines, looking fresh and vivacious with a nice layer of film grain present. Reds and blues really pop from the image, while skin tones of characters are stable and well rendered. The film is shot without hardly any high contrast moments, but each color appears distinct and bold. Essentially all instances of scratches and damage have been unobtrusively erased. The film looks magnificent. Audio is presented in a 2.0 DTS-HD Master Audio track that is clean and peppy, with Bill Conti’s news theme-like score leading the way with its bright tones. 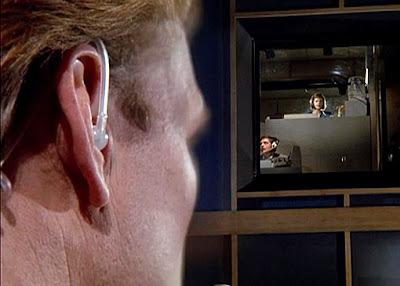 The film is mostly dialogue, which is crisp and clear, but some moments, such as bursts of gunfire during a live report, provide some heft to the stereo mix. Again, Criterion easily surpasses Fox’s barebones DVD with a series of extras that is more comprehensive than it appears at first glance. A new audio commentary featuring James L. Brooks and editor Richard Marks gives Brooks ample opportunity to be self-deprecating, while a three-part documentary on Brooks’s career shows just how wide-ranging his talents are. His work on The Mary Tyler Moore Show, Taxi and The Simpsons is examined on equal footing with his film work, and the excellent piece features lots of interviews with collaborators, including Julie Kavner, Marilu Henner, Hans Zimmer and Wes Anderson. Another fantastic inclusion is a 20-minute interview with veteran CBS News producer Susan Zirinsky, who served as an inspiration for Jane Craig and was also a consultant on the film. This is the kind of extra that only Criterion would pursue, and it makes the package all the more well-rounded for it. Zirinsky speaks intelligently both about the news industry at the time and the film itself, where it appears she played an integral role. An alternate ending, which provides a more definitive conclusion to the love triangle, is included along with a lengthy audio introduction by James Brooks. Ultimately, this ending doesn’t work as well as the original, but Hunter and Hurt are both great at selling the alternate reality. About 20 minutes of deleted scenes are also included with optional commentary by Brooks. Many of the scenes deal with a subplot about a government source that was entirely cut out of the film. Also included is a Fox-produced featurette featuring interviews with Brooks, Brooks and Hunter created during filming. It’s strange that this piece didn’t show up on the Fox DVD, and though it starts out with a cheesy voiceover introduction, the interview footage is good. Even better is about 20 minutes of outtakes from that same session, which includes more interview and on-set footage. The theatrical trailer and a booklet with an essay by critic Carrie Rickey round out the package. I’ve sung the praises of Broadcast News as long as I’ve known about it, and this Criterion release makes it even clearer what a great film it is.